Mary Bailey-Baxter is a lifetime dog lover and owner, and has been a leading member of the Sierra Vista canine community for over 15 years. Dogs are her work, hobby and life. Mary began her canine career as a professional trainer after attending Arizona Canine Academy's trainer and instructor course (ACA). She has taught all levels of obedience to dog and puppy owners in Sierra Vista and the surrounding communities through the City of Sierra Vista Department of Parks and Leisure. 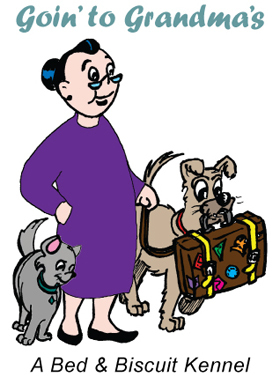 She has counseled owners and taught private lessons in their homes to produce healthy pet/owner relationships. After graduating from ACA and working part time for her teacher and mentor Rocky Boatman, Mary was offered the position of head instructor for ACA, which students from around the world attended to become professional trainers / instructors. Mary's responsibilities included teaching all aspects of the program, which encompassed nutrition, behavior, and business development, as well as supervising hands-on training at the local animal shelter. Mary has participated in many aspects of dog showing. She has handled dogs in American Kennel Club dog shows, taken her own dogs into the obedience ring, and has volunteered regularly as a ring steward for the local kennel club. She has judged AKC obedience matches, as well as 4H obedience competitions throughout the state. Joddi Harbuck was born in Michigan, but Arizona is her home. She began her career with Goin' to Grandma's in April of 2006, filling all positions from kennel help, grooming, office assistant to General Manager. Joddi knows most of Grandma's residents by name and they love her. Joddi loves all animals but has a particular affinity for Dachshunds. She shares her life and home with her husband, two children and six Dachshunds.